You really, really hate me. So, yeah. We hit the tripe milestone about 8.2 seconds after the oyster video went up. I said it once; I'll say it again: sadists. You're all sadists. (but I love you) It's been fun getting emails from Jeff at Share Our Strength with the $$ updates because they're written in a tone where I SWEAR I can hear him snickering and better-you-than-me-ing when we reach each level of giving. Even my mom is harassing me with phone calls of "So.... (sing-songy voice overlaid with a snort while choking back a guffaw) how were those oysters? (snort, snerk, cough, choke)"
Voice: Thank you for calling Bibiana, this is Christian, how may I help you? Me: Hi, Christian. My name is Carol Blymire, and I have a question for you. Christian: Yes Carol, what can I do for you? Me: -ten in the tripe dish you guys have on the menu. Christian: AAHAHAHAHAHAHAHAHAHHAHAHAHAHAHHAHAHAHAHAHAHHAHAHAHAHAHAHHAHAHAHAHAHAHAHHAHAHAHAHAHHAHAHAHAHAHAHHAHAHAHAHAHAHHAHAHAHAHAHAHAHHAHAHAHAHAHHAHAHAHAHAHAHHAHAHAHAHAHAHHAHAHAHAHAHAHAHHAHAHAHAHAHHAHAHAHAHAHAHHAHAHAHAHAHAHH!!!! I don't think I've ever heard of anyone making a bet based on the loser eating tripe. That's awesome. Christian: Ours is the best in the city. Chef makes it with roasted tomatoes, cheese... you'll love it. I promise. Me: Do you have a fully stocked bar that I can take advantage of if I need it? Christian: Of course. We'll line up whatever you need. So, I told Christian about the blog and about what you all are doing to help Share Our Strength, and he hooked me up with a table the next day at lunch. I called my friends, Chris and Brandon, to invite them along (they were there for Oystertastrophe 2009) and prepared myself to challenge a significant food phobia: tripe. If I could channel my inner Bernie Mac for just a second: America? I did not want to do this. I mean, I love that you all care about the kids, and hunger, but I didn't really realize how anxious this was making me. I've always been a pretty adventurous eater, America, but when I have a bad experience with something, I don't easily get over it, if at all. But knowing it was for a good cause made it something I knew I had to face. I ordered two small courses in advance (a tilefish crudo with turnips, red onion and mint; and, a little plate of sweetbreads with orange and fennel -- both were phenomenal), and then realized I had to address the steaming hot ("atomic" as it was described to me) bowl of tripe in front of me, crying out to be eaten. It had cooled enough that I couldn't put it off any longer. Even though there were pieces in there that looked like segments of someone's gums with all the teeth pulled out (::::shudder::::), I think I'm gonna petition the Nobel Prize committee to bestow a special lifetime achievement award upon Chef Nicholas Stefanelli, because you guys? I think I kind of like tripe. I KNOW. Now, this is not to mean that my lovely darling chef friends who read this blog should see this as a call to action to slip me an extra course of tripe when I dine in your restaurants. Nice try. DO NOT DO THAT. Nicholas' tripe was cut into pretty small pieces, and done in a slow, long braise with tomatoes and herbs and a quite lovely amount of parmagiano-reggiano. He came out to say hello just before I ate it and offered some advice: "If you just close your eyes and don't think about what you're eating, it'll be fine." When someone tells you NOT to think about something, you think about it even more, right? So, I took another minute or two to psyche myself up and thought about rainbows, unicorns, lollipops and Donny Osmond -- anything but a bovine alimentary canal. The first few bites were actually really good. I followed them with a few sips of wine, and I think Chris and Brandon (and our waiter) thought I was done. But, I wasn't. I finished the whole dang bowl. Brandon had one bite, but I finished every last bit and sent an empty bowl back to the kitchen. Mission accomplished. Mission accomplished, indeed. Bold, caps lock, hell yeah. So, thank you to Chef, to Christian, and the entire team at Bibiana for making this week's visit a really special one. Can't wait to come back! When we reach $1,000 in donations, I'll eat a handful of cilantro. Raise $8,000 (meeting last year's donations) and I'll tap dance in front of the White House. Yes, I own tap shoes, and no, I haven't used them since 1986. Think we can get to $10,000? If so, I'll eat a softshell crab with a side of durian. Reach $15,000, and I'll go work the line in a restaurant. If we go above $30,000, I'll sweeten the giveaway pot and take one lucky donor to Alinea for dinner sometime in 2010. 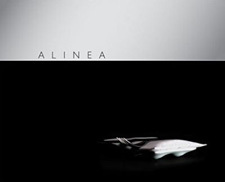 And, if we reach $100,000 in donations to Share Our Strength, I'll not just change my name to Alinea Blymire, I'll take it one step further: I'll legally change my name to the different sized circles on the Alinea menu. Don't believe I'll do it? TRY ME. Prince ain't got nothin' on me. And here's the thing: We've already reached the celery milestone. That video's coming soon. We're a few hundred bucks shy of $8,000 (last year's milestone), and my friend Jen's son, Jonathan, is really, really hoping we'll get there. In fact, he even sent a drawing of me tap dancing in front of the White House WHILE BARFING UP TRIPE. I love that kid. So, throw a few bucks to Share Our Strength. I'll do the tap dancing, and not the barfing. PROMISE. I feel your pain. I do, really I do. I positively hated it. Could not try it again ever! I think I'll make another donation for your cause, you deserve it! Oh, no... tripe. My dad is always trying to get me to eat it again. Not. Going. To. Happen. You are a better woman than I. Headed over to throw a few bucks at Share our Strength. Nice Work! Way to go with the tripe. Suggestions for the celery: peel it first, get rid of those strings. Maybe even slice it thin and blanch it, toss it in ice water ('cause it's so dang pretty that way! It becomes such a gorgeous, translucent color). Can Jonathan please do my Christmas cards next year? Good on you for the tripe. And I can't help but wonder what the dealio is with the celery - but I'm sure I'll find out. Congratulations!! Been reading your blog for a couple of years now, and I love both your writing voice and your verve. You have all inspired us to be a little more generous this year... at your expense. If you were fundraising for NPR, they wouldn't have to have a campaign every 4 weeks. They'd just offer Karl Kassel tap-dancing in front of the Whitehouse with Carol Blymire and they'd be set for a year. That last picture with the spoon is SUPER cute. Glad to see you're having fun with all of our donations. Hmmm... big fan of tripe, actually. If you ever get to San Francisco go to Chris Cosentino's place Incanto and ask Chris to make you his crispy fried tripe. Seriously good eats. Really. "Aw, man! I forgot to draw the big burp. Tell Carol I'm sorry. She can draw the burp if she wants. Oh, and tell the people that like my picture thank you." An inspiration to cook (slowly working through French Laundry now),to try new foods and places (hoping to eat at Central the next time I'm up in DC) and of course to give to a very worthy cause. Many thanks, and Merry Christmas to you! Celery should be a piece of cake! Although I will say that if I was the one making the bets, eating a whole raw tomato without throwing up would be a tough challenge for me. This is such an awesome idea, I love watching the videos. Tripe isnt terrible, but I think its the texture and flavor of rubberbands. Maybe I haven't had it prepared well. Peel the celery first. I love celery, but even I hate the strings. Welcome to the world of tripe eaters! Very enojoyable video. I reposted it on my blog dedicated only to tripe: http://troppatrippa.blogspot.com/2009/12/another-one-bites-tripe.html. For not having tasted tripe before, trippa alla parmigiana was one of your best possibilities, and apparently you were very lucky in finding a great chef. I was going to say that your video is proof that anything can be tasty in the hands of a good chef, but I've never had tripe done by a "chef." I've had tripe in pho, I've had it in menudo, I've had amazing tacos de tripa. All were tasty, tender, and well executed. Your video is proof instead that tripe is indeed good food. Whether it's from a chef or a cook or a grandmother at home in a kitchen, its just something that needs a little experience, tradition, and/or love. Well, I've very proud of you Carol. I knew if you tried tripe that was cooked really well you'd like it. Congrats on raising more money for SOS, it's such a great cause.